Tamara de Lempicka was a Polish painter known for her distinctive Art Deco style. In her self-portraits and depictions of chic figures, Tamara de Lempicka simplified volume and space into tubular and crystalline forms. “My goal is never to copy, but to create a new style, clear luminous colors and feel the elegance of the models,” she once explained. Born Maria Górska on May 16, 1898 in Warsaw, Poland (then part of the Russian Empire) to a wealthy family, Tamara de Lempicka spent much of her childhood in Switzerland and Italy where she was influenced by the works of Renaissance and Mannerist masters. Living in St. Petersburg during the 1917 Russian Revolution, she and her husband fled to France to escape the Bolsheviks. During the 1920s, she became an integral part of the Parisian avant-garde scene and was acquainted with Pablo Picasso, Jean Cocteau, and André Gide. Tamara de Lempicka is best known for her polished Art-Deco portraits of aristocrats and the wealthy and for her highly stylized paintings of nudes. 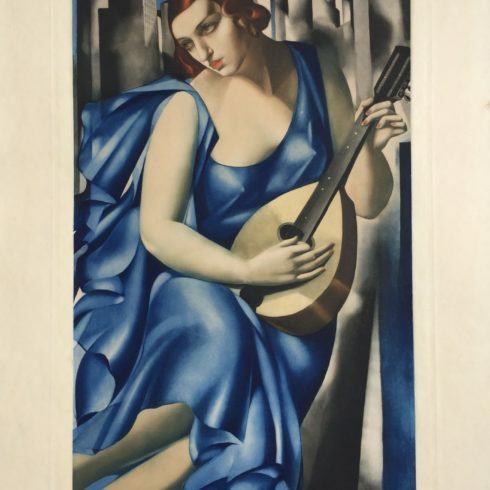 Our fine art gallery has the finest quality Tamara de Lempicka original prints, etchings, and aquatints. We have a large inventory available off-site and we encourage you to make an appointment to see specific works you are looking to collect. We are happy to meet you at either our art gallery showroom or at your home or office for a private presentation.